The 9mm ARX Inceptor round is a polymer round that is not a hollow point and is not designed to fragment. It is designed to disrupt the tissue around the bullet due to the grooves that are cut into the polymer that are in the mold the polymer is formed in. Is this round a good choice when using self-defense weapons? Let’s see what happens when we shoot it into a 16-inch block of 10% ballistic gelatin, which is designed to emulate human tissue. It’s the same standard the FBI uses. Some lightweight clothing is wrapped around the gelatin block too. 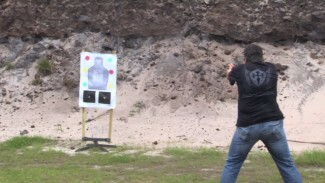 Rob Pincus shoots the 9mm ARX Inceptor Ammunition into the block from roughly 12 feet away, because we know that about 90% of defensive shootings occur at between nine and 15 feet (as listed in the defensive shootings database Rob relies on). 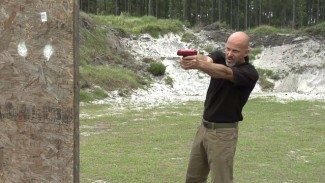 After shooting the block, Rob inspects it to see what kind of tissue damage the ARX Inceptor has caused, especially in the 12- to 18-inch range. We can see through the clear gelatin block that the bullet twists as it goes in, and there is some tissue disruption beyond the permanent wound cavity, though the wound cavity appears to be what we would get from a solid-point bullet. It is not a type of bullet designed to expand. However, the non-hollow-point shape provides reliability in performance, which is a plus. Ammunition is an essential part of your defensive gear. Because the tissue damage created by the ARX Inceptor is not that impressive, Rob does not recommend it for personal defense, with one exception: if you are in an area where you cannot carry hollow-point bullets. Many such areas exist worldwide, and even in the United States. For example, New Jersey strictly controls the use of hollow-point bullets outside the home. Know your local laws and those of any place you are traveling to, so you will know which rounds you can legally carry. 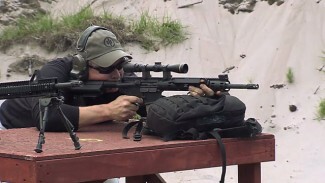 Instructor Don Edwards discusses and demonstrates the differences between shooting with a bipod and shooting from an improvised rest. Both methods can dramatically increase deviation control, but the improvised rest techniques are much more versatile and universal.